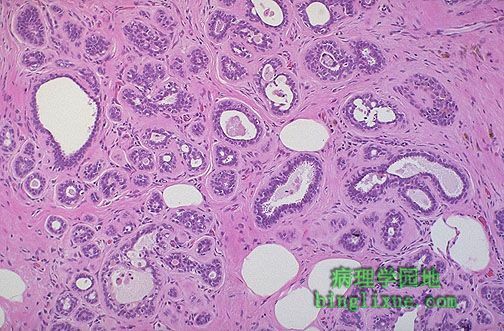 The normal microscopic appearance of female breast tissue is shown here. There is a larger duct to the right and lobules to the left. A collagenous stroma extends between the structures. A variable amount of adipose tissue can be admixed with these elements. 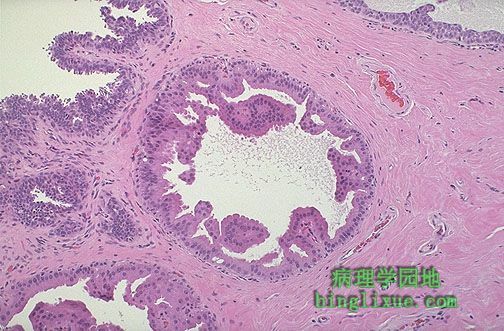 At high magnification, the appearance of a normal breast acinus is shown here. Note the epithelial cells lining the lumen demonstrate apocrine secretion with snouting, or cytoplasmic extrusions, into the lumen. A layer of myoepithelial cells, some of which are slightly vacuolated, is seen just around the outside of the acinus. 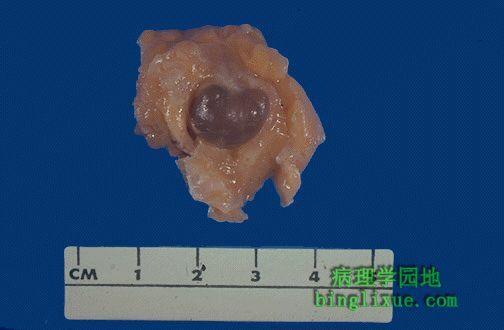 This is the gross appearance of fibrocystic changes in the breast. A 1.5 cm cyst is noted here. This can lead to palpation of an ill-defined "lump" in the breast. Sometimes, fibrocystic changes produce a more diffusely lumpy breast. 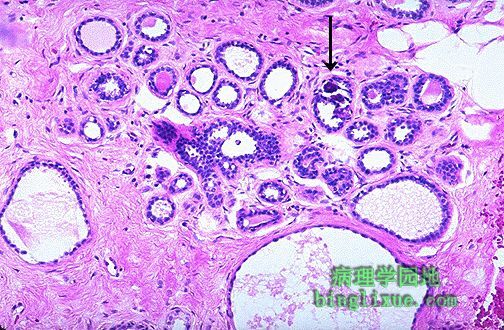 This is the histologic appearance of fibrocystic changes in breast. 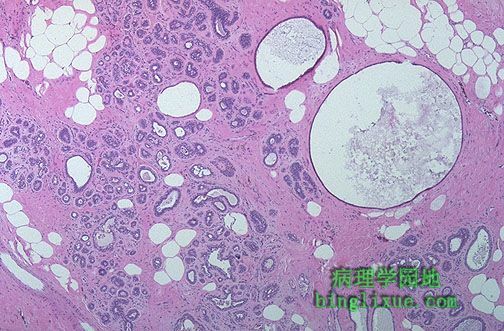 There are cystically dilated ducts, areas of lobules that are laced with abundant fibrous connective tissue (sclerosing adenosis), and stromal fibrosis. There is even a small area of microcalcification seen just to the upper right of center. No atypical changes are seen here. Another example of microscopic fibrocystic changes of the breast are shown here. Fibrocystic changes account for the majority of "breast lumps" that are found in women of reproductive years, particularly between age 30 and menopause. At low power, the prominent cysts of fibrocystic changes are shown. The cysts are lined by a single epithelial layer of varying height. There is prominent apocrine change of the cells lining the cysts in this example of fibrocystic changes of breast. 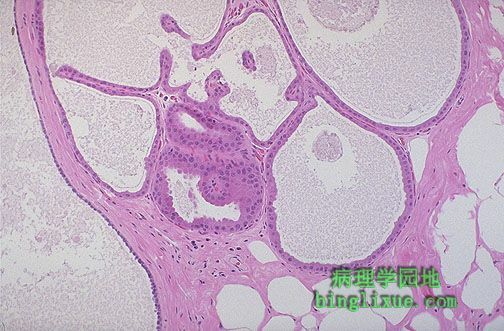 Note the tall, pink, columnar nature of the epithelial cells. This appearance is benign. Prominent sclerosing adenosis, one of the features of fibrocystic changes, is demonstrated by the appearance of a proliferation of small ducts in a fibrous stroma. 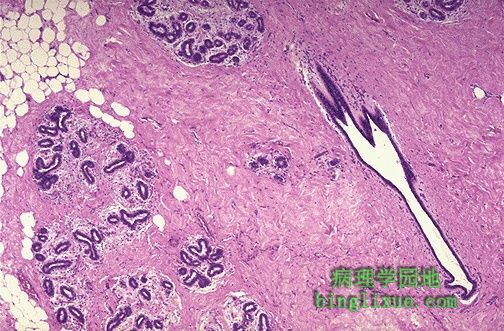 Although it is benign, the gross and mammographic appearance may mimic carcinoma, and it can be difficult to distinguish from carcinoma on frozen section. 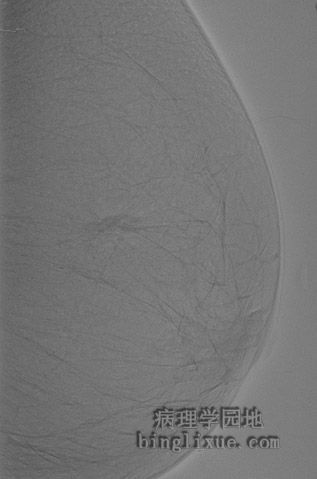 This mammogram demonstrates a suspicious lesion that could be a carcinoma or just an area of pronounced sclerosis with fibrocystic changes. On biopsy, this was benign. 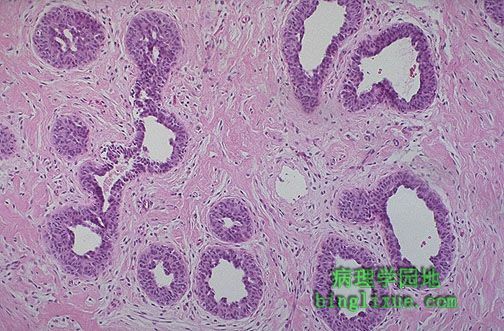 These breast ducts demonstrate epithelial hyperplasia. 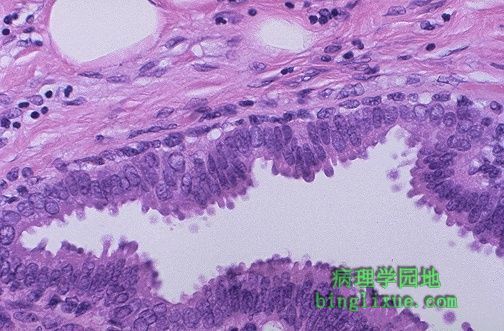 The epithelial cells are multilayered. There is no atypia. Thus, just as with fibrocystic changes such as fibrosis, cysts, and sclerosing adenosis, there is no increased risk for carcinoma.